Please sign up today to attend the Hoosiers screening this coming Sunday, March 13. The afternoon begins at Yankee Doodles on the 3rd Street Promenade in Santa Monica for the CBS March Madness Selection Show and then moves on to the Criterion Theater for a screening of Hoosiers, considered by many to be one of best sports movies ever made. Two special guests who will attend and speak are Maris Valainis, who played Jimmy Chitwood (who takes the game winning shot at the end of the movie), and Emmy-winning TV producer- director David Anspaugh, who directed Hoosiers and other movies such as Rudy, The Game of Their Lives and Fresh Horses. Further information can be found in the newsletter but space is limited and if you have not yet registered I'd encourage you to do so now. As you may already know, March also includes the annual club service project at the Los Angeles Foodbank, which we will once again co-sponsor with Northwestern. This has turned into a wonderful club tradition as we assist the Foodbank in its efforts to provide food to the needy members of our communities. Then, after a morning of packing and sorting the donated food items, we'll all head out for lunch at a local restaurant. Last year, there were over 30 members of our group who attended the lunch and we hope to have even more this time. Finally, I'd like to once again mention the Person of the Year dinner on April 13, when the Club will honor former Paramount Studios CEO (and Northwestern alumna) Sherry Lansing and long-time club volunteer and past president Len Roth (Michigan State) will receive the Member of the Year Award. Held at the beautiful home of the Tournament of Roses in Pasadena, this is always one of the highlights of the year for our club and we look forward to the possibility of seeing you then. Further information about the dinner can be found in this newsletter. The dinner can only accommodate 100 guests so I'd encourage you to register sooner than later. We look forward to seeing you at one - or all! - of these events this spring. As always, check the club's website for the latest club news and events. And, of course, you are always welcome to contact me at 626.334.5676 (home) or wildcats76@verizon.net. Join us Sunday March 13th for a special 25th anniversary screening of the basketball cinema classic Hoosiers. The evening will also be topped off with a Q&A session with Director David Anspaugh and the film’s game winning star Jimmy Chitwood (Maris Valainas). Proceeds from this event will go to the Variety Boys & Girls Club of Boyle Heights for a new gymnasium. We have fun. We do good. We'd love you to volunteer with us Saturday morning, March 26th, for our Club's annual community service project at the Los Angeles Regional Foodbank. Please RSVP HERE by 3/20. Stay tuned for details on our Spring 2011 event schedule, including Long Beach wine tasting and a LA Kings hockey game. Northwestern Dance Marathon Sets New Record! Thanks to the LA area Northwestern alumni who participated in this year's Dance Marathon Trivia Night. A fun time was had by all and we raised over $300 in support of Dance Marathon. The NU Club of LA is excited to announce its first in a series of neighborhood Happy Hours. Join us at Copa D'Oro in Santa Monica on Monday night, March 14, for good food, good cocktails and great company. There's no cover charge and the $5 drink and food specials last all evening long, so come on out and catch up with your fellow alums on the last day before March Madnesstakes over. This is this first in a series of casual after-work get-togethers that the NU Club of LA is going to be hosting around town, from Burbank to Silverlake and everywhere in between, so help us kick it off in style at the club Yelpers give 4 stars and call the "Best Happy Hour in Santa Monica." Then, join us at one of most rewarding recurring events as we volunteer at the Los Angeles Regional Foodbank on Saturday, March 26th (See pg 3 for details). Bring friends, neighbors, and family (kids must be 14 and older) to spend the morning volunteering to help this cause that helps so many others. Local alumni host a great event for the kids! Join Penn State alumni and friends for a BBQ at Eberle Winery in Paso Robles hosted by PSU alumnus and renowned winemaker Gary Eberle! 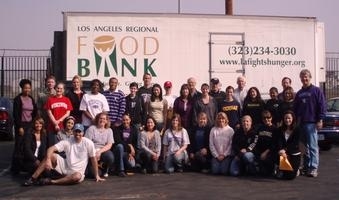 Sign up today for our 21st annual Community Service Project with Hillsides in Pasadena. It's a great opportunity to enjoy the outdoors with your fellow Penn Staters and help out a fantastic organization! Join us for the chapter's first campout in June! Join the OC Chapter to cheerlead the PSU Men’s volleyball team on March 12 at LBSU! Don’t miss out on this $6.00 special group rate that will surely sell out! For information or to reserve your tickets, go to PSU LA Men's Volleyball or www.ocpsu.com. For more information: Brian Snyder, Sports Chair, (714) 893-1936 or Brian.Snyder@ferguson.com. Last day to send checks is Feb. 20. Tickets will be at a pre-game Happy Hour or at Will Call 20 minutes prior to game time. Chapter membership is annual from July 1 to June 30 but new members are welcome any time! Dues are $20/individual and $30/couple, and support chapter administration, events and the Endowed Scholarship Fund. Please check the website for updated dues information and the2010-11 Membership Application. Tuesday, March 15, 2011 - 7:30 p.m.
Robin Fichtelberg, BS '89, is running the Los Angeles Marathon on Sunday, March 20. Besides the personal satisfaction of actually finishing - and hopefully beating her 5 hour 7 minute time from last year, she'd like to raise money for the club scholarships given to students from LA and OC attending Purdue. The race is 26.2 miles - perhaps a dollar per mile? $5 per hour? Robin will match the first $1,000 raised. Donations are tax deductible if given directly to Purdue. Please email Robin (fichtelberg@sbcglodal.net) for more information. Thanks for helping! Hope to see you out there cheering Robin and 25,000 other crazy people on!